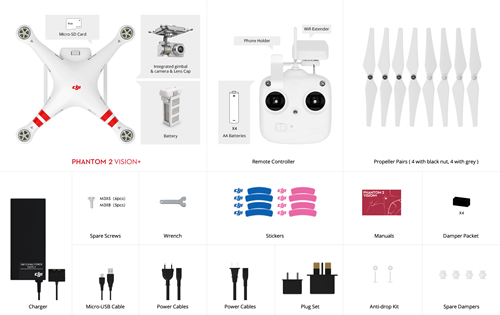 My review of the DJI Phantom 2 Vision Plus (known as the Vision+) is somewhat different from every other RC helicopter review I have ever done for the simple reason it's not a quad rotor I would purchase myself. That of course doesn't mean it's not a fantastic product, but it's not really meant for more serious RC hobbyists. The typical person who will be purchasing and using the DJI Vision+ is someone who knows practically nothing about RC nor has the desire or time to learn about it. All they want is a full proof and easy way to take breathtaking HD/pro quality aerial video and still shots while having some basic FPV capability as well. That is what the DJI Phantom 2 Vision Plus is all about. I was just introduced to the DJI Vision+ this past weekend while visiting some family. My one cousin-in-law had purchased a Phantom 2 Vision Plus a couple weeks prior, and when she told me about it, I at first had no idea what she was even talking about. She kept calling it her "flying camera" and only after asking a few probing questions did I realize she had a quad-rotor RC aircraft. I of course wanted to see it after I realized what it was. She let me fly it (after a little reassurance that I did know something about these things), and I even record some video while watching it in real time on her Galaxy S4 phone that she attached to the radio control unit. I was quite impressed but it was just another RC quad rotor (a drone as the media loves to so incorrectly call them) and really did nothing I was not already used to, not to mention I thought the radio (controller) felt & looked cheap. The little plastic clamp on it that was holding her phone wasn't something I would put much trust in; but she has had no issues with it and certainly didn't feel my criticism was at all justified. After she started telling me all her "flying camera" could do and how she was flying it around like a pro only after a couple weeks, did its true potential start sinking in and I soon realized she was right. Then she pulled out her tablet and showed me some of the video projects she had taken with it... I was blown away! Only then did I really understand how amazing the DJI Phantom 2 Vision Plus is and the mass market appeal it will no doubt captivate. The video and stills she took were spectacular! Better than what I could pull off and I've been flying RC helicopters for over 25 years. This was her first ever RC anything, and she knows practically nothing about it! She is a real estate agent & photographer however and that is where her skills along with all the technology on-board the Phantom 2 Vision Plus combined to make all the difference between her outstanding footage compared to my mediocre at best attempts. For people who don't know much about our hobby and quad/multi rotor RC helicopters in general; DJI Innovations is perhaps the most recognized name when it comes to this new technology. There are countless multi-rotor brands out there right now, but DJI is easily the most recognized and most popular in the main stream. I personally feel they offer the best overall combination of value and quality in the many products they produce from the less expensive consumer & hobby grade products, right up to pro level equipment. I actually fly one of their Frame Wheel F550 Hex multi-rotors and have nothing but great things to say about it. DJI Innovations started out a number of years ago making electronic stabilization and autopilot systems for regular RC helicopters. As the technology advanced and as the interest in RC quad & multi rotors started to soar about 4 years ago, DJI switched its focus & efforts toward this new form of RC flight. In the industry, DJI is known to have some the best GPS enabled stabilization/autopilot systems for both conventional RC helicopters and RC multi rotors, with professional flight control systems such as the A2 & WooKong to more affordable hobby/consumer grade systems such as the Naza. DJI Innovations also excels at building some of best "performance for the price" motorized camera stabilization systems (called gimbals), for various types of cameras from the smaller GoPro's right up to larger pro quality HD and 4K Ultra HD image recording equipment. DJI Innovations has four (4) primary lines of quad/multi rotor aircraft also called "platforms" to cover all ranges of experience & performance levels. The main "consumer" platform is the DJI Phantom 2 - out of the box ready to fly. Their Frame Wheel Kits that have to be built, configured, and programmed, are geared toward the more experienced RC hobbyist/enthusiast. The Inspire 1 is DJI's ready to fly professional multi rotor. It has several advanced features such as pivoting arms to allow a 360 degree unimpaired camera view. This truly is the "flying camera" that bridges the gap between hobby grade and professional grade AP quad copters. It provided the same easy out of the box operation as the Phantom 2 Vision Plus but on a professional level. Their Mavic Pro is perhaps the most popular flying camera on the planet right now. The Mavic Pro has essentially taken over the Phantom line as the true consumer grade aerial imaging platform. 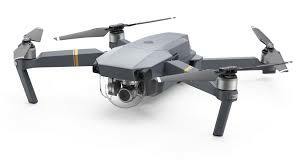 Unless you are looking specifically at an older Phantom, and that is what brought you to my page, the newer Mavic Pro is leaps and bound ahead technology wise. 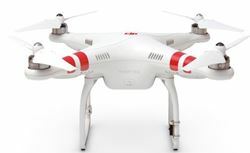 The Phantom 2 Vision Plus as the name suggests is a normal Phantom 2 quad rotor RC helicopter. Is uses DJI's proven & robust Naza flight control/stabilization system with GPS and compass sensors (Naza P2V is the model designation). It's similar to the Naza M V2 but uses different firmware specifically catered to the Phantom 2 Vision Plus. Just think of the Naza as the "brains" inside your quad copter. It is 100% responsible for all flight control. Even when you are controlling your Phantom, it is actually the Naza that is doing all the flying. The Phantom 2 would be classified as a "medium" sized 350 multi-rotor with a diagonal arm to arm measurement of 350mm. The Phantom 2 sits up high on two sets of tall landing struts to allow the room required underneath its belly for the camera and 3 axis gimbal system. Aircraft power is provided by a proprietary "smart" 5200mAh 3S LiPo battery (more about this later in the review). Four 920Kv brushless motors spin 9" propellers controlling both lift and directional movement. The electronics are all housed within the white frame/fuselage including an array of LED lighting in the four arms for orientation help or a little night flying fun (my personal favorite thing to do quad/multi rotors). The LED's are also used as visual "systems status" indicators, relaying information back to the pilot such as low battery alert and GPS satellite acquisition by color and flash sequences. GPS is of course the reason why this quad as well as others that have GPS positioning are so easy to fly for the uninitiated. GPS combined with the 3 axis gyro and accelerometer technology in the Naza, magnetic compass, and barometric pressure sensor give impressive position hold both horizontally and vertically. All that means is you get a true "hands off - zero skill required" flight experience, even in moderate winds. GPS positioning/return to home worked flawlessly just as it does on my Blade 350QX & DJI F550 hex rotor. Flight times were about 20 minutes which was indeed impressive! Paired with the Phantom 2 is the Vision + side of the equation. This a combination HD video/still camera, video/telemetry transmitter, and a 3 axis brushless motorized stabilization gimbal. The motorized gimbal is what gives your video that professional fluid like image quality. They work by using 3 gyros that detect the 3 axises of possible aircraft movement (Pitch, Roll, Yaw) and as movement is detected by the gyros, the gimbal's motors move the camera in the opposite direction to keep it perfectly still and level no matter what the aircraft is doing. Below is a neat video showing just how much better the image quality is between having no gimbal, a 2 axis gimbal, and a 3 axis gimbal. Gimbals have to be perfectly configured and balanced to the camera that they are being used with for them to work correctly. Because the Vision+ has both the camera and gimbal already matched together, it's one less fairly complicated process you won't have to deal with. Because this is a DJI gimbal - it's a good one. Image stabilization is indeed super impressive! The 3 axis of camera stabilization really does give a level of pro quality stabilization I never thought would be possible at this price point. You also have the option to tilt the one axis of the gimbal (pitch) so the camera can look in a 90 degree range from straight ahead to straight down below the aircraft. In FPV mode, the gimbal locks so as you roll and pitch the aircraft, you'll see the image tilting to give you that true FPV flight experience asa if you were onboard the Phantom. Non FPV mode uses full camera stabilization for a fully stabilized pro quality image. The gimbal is mounted to the DJI Phantom 2 Vision Plus with 4 nice soft vibration dampeners/isolators that work very well to absorb vibration and eliminate "Jello-effect". The other neat thing I noticed is there are a couple safety pins that prevents the dampeners from separating (DJI calls it an "anti-drop-kit"). In other words, if the soft dampeners did separate due to high G-force or maybe even hitting something, the gimbal and camera assembly won't fall off the aircraft. Seems like a no brainer - right? However, it's a safety tethering method you actually don't see on most anti-vibration mounting plates and is something we as hobbyists generally have to build ourselves. Again, DJI has all the bases covered for the non-hobbyists already. All gimbal and camera functions are controlled by way of your smart phone using DJI's Vision App. The number of camera settings/options available using the Vision App is impressive. The other really neat feature the Vision App supports is their ground station setting. This enables you to set a way point flight path or "flight mission". This is about as fully autonomous as recreational model flight can get and really does transform the DJI Phantom 2 Vision Plus into a hands off flying drone. For obvious safety reasons, way point mission flight is restricted to a maximum range of 500 meters from the home position (where the Phantom took off). There is a version of the Vision App for both iOS & Android which are downloaded for free from the App Store, or Google Play. Support is iOS 6.1 or newer, and Android 4.0 or newer. The camera is actually very decent with a 1/2.3" CMOS sensor boasting 14 megapixels and has a still resolution of 4384×3288. Stills are shot both in JPEG and RAW file formats. The camera can record HD video and/or stream up to 480p video back to a smart phone or tablet. HD recording is full 1080P at 30 frames per second, or can be changed to 1080i at 60 frames per second, or 720p at 60 frames per second. Recording field of view is selectable between 110 degrees & 85 degrees. Because the camera uses a CMOS imaging chip instead of CCD, the low light performance does suffer and gets grainy in low lighting levels that most CMOS cameras (such as the GoPro) suffer from. WiFi video streaming as I just mentioned is not HD (best possible is 480p); but is adjustable between 320x240 15 frames per second up to 640x640 30 frames per second. The higher the video streaming image quality you select, generally the slower the refresh rate became I found and the little quad can get ahead of the video feed that is being streamed back. In short, this is not a performance minded FPV flight experience; but again, for the average person who is using it primarily for aerial photography & video recording, it works perfectly fine allowing you to see on your smart phone exactly what the camera is seeing so you can move the aircraft or tilt the camera to give you that perfectly composed aerial image you are after. As I mentioned, video, stills, and telemetry are streamed on the 2.4GHz WiFi band and has a claimed range up to 700 meters in optimal/ideal conditions using the included WiFi booster that is mounted atop the radio controller. My cousin has never tested the range as she is generally staying well within visual range all the time for the type of work she does and I was not about to test the range limits seeing this was her cool toy - not mine. I would think in real world applications where RF conditions are rarely ideal, getting in the 400 to 500 meter range is likely a little more realistic. The telemetry data transmitted back to the smart phone display gave a decent OSD (on screen display) experience. OSD information includes aircraft battery level, GPS signal/number of satellites (needs to see a minimum of 6 for GPS enabled flight), WiFi signal strength, remaining shots on camera, SD card status, and radar/home direction status which gives info such as distance & direction from home, aircraft altitude and speed. Radio control on the Phantom 2 Vision Plus is transmitted on the 5.8 GHz band to lower the RF (radio frequency) noise floor between the video & telemetry transmit signals and the control side of operation. I have a full article on video and control RF separation on my FPV Video Transmitter Page if you want to know more about the meat & potatoes. That said, all you really need to know is the 2.4 GHz and 5.8 GHz RF bands work very well together for interference free, low noise floor operation. 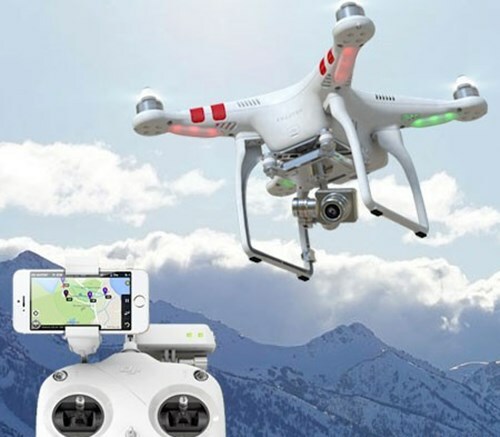 The DJI Phantom 2 Vision + in other words follows the golden rule of "Thou shalt not transmit video on the same, close to, or multiple harmonic of the frequency the radio control system uses". Video is recorded on a micro-SD card that is located in the top plate of the camera gimbal allowing easy access. The DJI Phantom 2 Vision Plus comes with a SanDisk 4GB micro-SD card which is nice as many manufacturers don't include SD cards. My cousin said that the 4GB card is plenty for a single flight offering over 20 minutes of 1080p HD record time. The Phantom 2 Vision Plus will however support up to 32GB micro-SD cards if you want to record several flights. What is nice however, is you don't have to remove the SD card to download the video or stills. The gimbal plate also has a micro USB port so you can easily download your video/stills between flights to your laptop or smart device through the included USB cable or wirelessly using the Vision App. This cable is also used for charging the WiFi range extender and to perform firmware updates on the Phantom 2 Vision +. The proprietary battery pack easily slides and clips into the back end of the Phantom 2. It has a LED light bar to indicate the battery level both during charging and while on-board the aircraft during discharging. There is a pushbutton on/off switch as well on the battery pack to turn it (the Phantom) on & off. 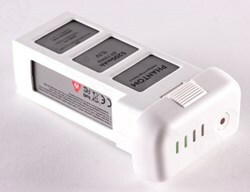 The battery takes a little over an hour to recharge using the included universal voltage charger. There is an optional 12VDC charge cable available for charging using your vehicle or other 12VDC portable source. The term "smart" battery is used because all the charge, balance, and protection circuitry is built right into the battery pack's logic board. It also monitors battery temperature and won't allow you to charge it if it's too hot or too cold. It even turns itself off if you forget it's turned on after about 10 minutes. The battery also sends out authenticity codes to the Naza P2V. The Naza will not allow the motors to arm if it doesn't receive the proper "handshake" from the battery in other words. The battery is actually a 3S2P pack meaning it uses six 2600 mAh LiPo cells. There are 3 pairs of two hooked in parallel to give the 5200 mAh capacity, and those three parallel pairs are then hooked in series to give the 3S 11.1 volts. Whenever I hear the term "proprietary", red flags go off. To me this is the only real problem the DJI Phantom 2 Vision Plus has. It's absolutely absurd in my opinion that the main consumable item (the LiPo pack), is restricted to what DJI offers and gives us no other battery options. It might be one thing if they were reasonably priced, but at $130 bucks for a 3S 5200 mAh pack, they are easily double if not triple the cost of a standard RC LiPo pack of the same voltage & capacity. 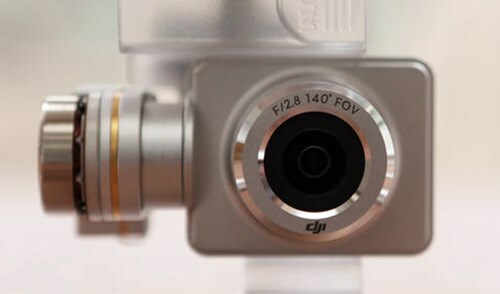 I do see the logic however for the market the DJI Phantom 2 Vision Plus is intended. Like my cousin who has no idea about proper LiPo battery care or how to charge one up if she had to use a computerized battery charger to do so. She doesn't want to know either! For this market, these proprietary smart batteries do make so much sense from an ease of use and safety standpoint. She also didn't understand why I thought it was outrageous to spend that much on a LiPo battery pack; so again for the intended market, they'll buy em up without question. For the RC hobbyist/enthusiast however, they are crippling, annoying, and way overpriced! Replace the Naza P2V with a standard Naza M V2 (fairly expensive and way more work than the average person would be willing to try). Take the logic board out of the DJI smart battery, install & wire it up right inside the Phantom 2 permanently. The memory on the logic board by all accounts is not volatile and won't be lost when powered down when removed from battery power. The on/off push-button switch on the logic board will also have to be relocated on the aircraft somewhere for easy access. You can then use normal LiPo packs as the logic board will still be giving the handshakes to the Naza when powered up and during the flight. This of course will void any warranty (as any hack would), but for the pure RC hobbyist, these were the only two workable solutions I could find unless DJI shares the encryption handshake key; allowing other aftermarket LiPo manufacturers to produce their own DJI Phantom 2 compatible smart battery packs (not holding my breath on that one). Let's not forget about the legal issues here as well. If DJI did allow that, they essentially lose control over their power systems and Phantom 2 Vision Plus's could be falling out of the sky when paired with cheap substandard smart battery packs. The LiPo cells are not what I would be worried about, it's the robustness of the logic circuit that would have me second guessing a "cloned pack". For the typical DJI Phantom 2 Vision Plus customer, this so called "smart battery" problem is not a problem at all. I actually debated whether I should even mention it in this review; but it's something I personally don't like, and I know if I didn't mention it, I would be getting emails by other hobbyists asking why I didn't. To put the smart battery issue to bed, here is my personal 3rd option around it. As a hobbyist/enthusiast, I wouldn't get the Phantom 2 Vistion Plus as I stated at the beginning of this article. I would get the DJI Frame Wheel F450 combo kit, pair it to the Zenmuze H3-3D gimbal and a GoPro Hero3... Proprietary smart battery issue solved! That is after all why DJI has the more advanced Frame Wheel kits, for us hobbyists to configure and modify to our heart's content. To sum this entire review up... 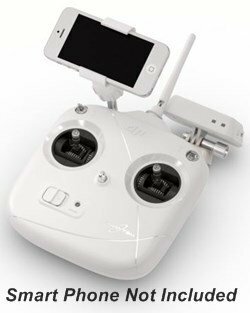 I think the DJI Phantom 2 Vision Plus is quite possibly the best out of the box, ready to fly AP imaging device on the market right now. It transcends the "RC Hobby" crowd and enters into a completely new market place that is much broader in scope. 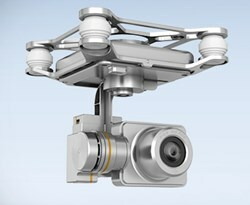 The first really easy to use, understand, and live with "flying camera" for the masses in other words. In my opinion it's not a good match, nor is it intended for the RC hobbyist or multi rotor enthusiast, but for 99% of regular folks out there - I can't think of a better product for HD AP. DJI is very smart by piggybacking known RC based stabilization and control technologies with WiFi / Smart phone technology for the FPV, imaging, and waypoint selection side of it. Combining the two worlds makes so much sense from a value and even "familiar comfort" perspective. Hook any technology up to a person's smart phone or tablet and they just seem to "get it". Lastly, I do strongly recommend reading the safety section on my FPV RC Page (about 1/3rd down that page). It has been brought to my attention that for me to give a proper review of this Phantom 2, I must also talk a bit about safety since you may be completely new to RC flight. There are dangers involved and very likely safety regulations governing this type of RC aircraft in your part of the world. You should be aware of these regulations before ever taking one of these things up in the air. Flying any RC aircraft is a privilege - not a right.